Award-winnng author Ursula K. Le Guin , who specialized in sci-fi and fantasy, passed away in January at age 88. Ursula K. Le Guin died at on Jan. 22 with 88 years of life and a full career behind her. Throughout her life, she wrote more than 20 novels, 13 books for children, over 100 short stories and seven lengthy books of critical essays, according to The New York Times. She is remembered for many accomplishments: her multiple Hugo and Nebula awards, her astonishing body of work and her immense talent for creating entire complicated and alien worlds in the span of a single novel. However, her most important contributions involved the work she did in genre fiction — fantasy and science fiction specifically — although she famously hated to be regarded merely as a genre writer rather than a serious artist. Le Guin wrote science fiction and speculative fantasy before those genres were considered anything close to professional or literary, and her work was doubly doomed because she was a woman writing them. Nevertheless, her futuristic novels “The Left Hand of Darkness” and “The Dispossessed: An Ambiguous Utopia” remain “staples of university courses” in anthropology and utopia as well as in literature, according to an obituary by The Guardian. “She talks about removing the labels of things and animals that reveal the inherent prejudice and categorization embedded in language,” said Wohlgemuth. 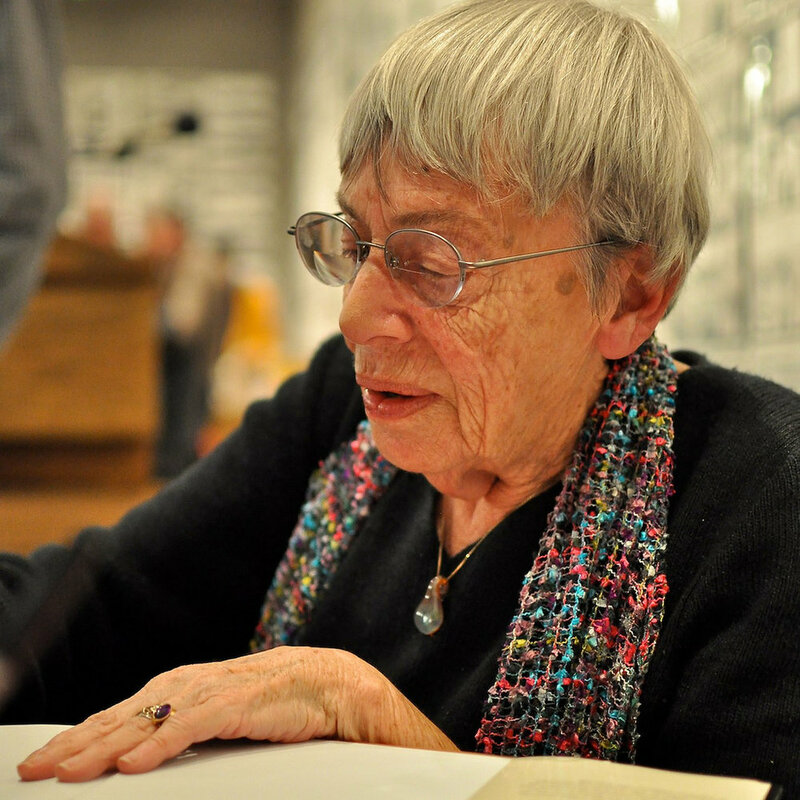 Outside Mount Holyoke, younger authors including Neil Gaiman, Junot Diaz, David Mitchell and Zadie Smith have all cited Le Guin as major influences on their work. In addition to helping create the markets that remain so wildly popular today, Le Guin revolutionized the genres in which she worked. Her feminism, her study of Taoism and Buddhism and, most importantly, her interest in anthropology, dramatically influenced everything that she wrote. They led her to create thoughtful, nuanced and complicated speculative literature, expanding on the worldview Tolkien, Heinlein, Asimov and the rest of her predecessors to take the genre to new and startling places. Her male heroes quietly subvert traditional masculinity within their personalities and their character arcs. In “The Left Hand of Darkness,” she imagines a society that is free of gender as a construct altogether. Her most famous fantasy series, the “Earthsea Cycle” takes a basic idea popular in fantasy novels — a cosmic struggle between good and evil — and shifts it to focus on balance between competing but complementary forces, a point of view informed by her lifelong familiarity with and respect for Taoism. Her work refuses to give difficult answers, preferring instead to allow readers to draw their own conclusions while emphasizing above all the values of kindness, balance and compassion she held so dear. Le Guin would say that artists cannot be relied on to tell the truth or predict the future, only to tell a story. Nevertheless, her work was powerful because of the heartbreaking compassion with which she told basic truths she shared her observations about humanity. “I talk about the gods; I am an atheist,” she said in her introduction to “The Left Hand of Darkness.” “But I am an artist, too, and therefore a liar. Distrust everything I say. I am telling the truth.” Through bizarre alien worlds and wizard temples, she certainly was.